Two lives, one big adventure around the world. Obviously we went to Mendoza for the wine. What we didn’t expect was to stumble upon a great little hostel, the Empredrado, which offered not only a free glass of wine every day (hello amazing!) but also a free empanadas making class! 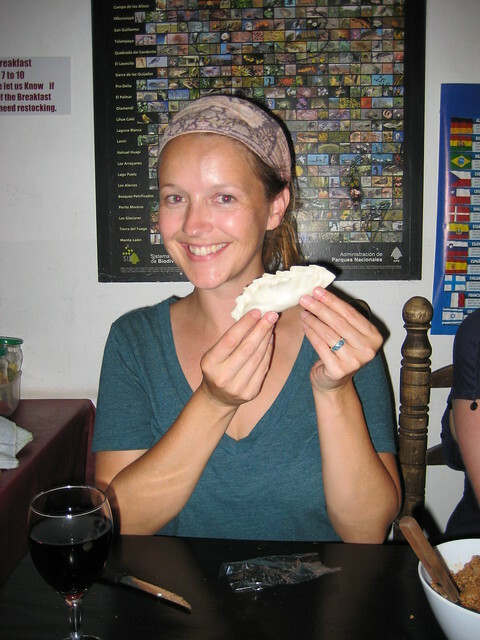 We have completely fallen in love with empanadas, in all of their forms, so we were super excited to be learning how to make them on our first night in the city. As it turns out, they are ridiculously easy to put together, especially when you can buy the dough, pre-cut to the perfect size, in any grocery store in Argentina. Basically, you prepare your filling, which traditionally is meat with onion, part of a hard-boiled egg and a piece of olive, though really you can fill them with whatever you want. Once that’s sorted out you put a little bit on one side of the dough, fold it over and crease the edges together. 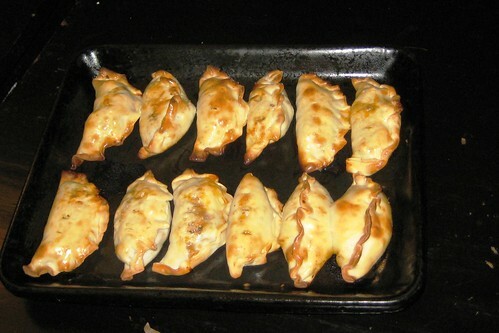 Place the ‘raw’ empanadas on a baking sheet, brush with butter, pop them in the oven and voila! Perfect empanadas! The first tray is finished. Don't put them too close together or you end up with siamese-empanadas. The next day, full of energy provided by my new favorite snack food and with some new-found friends, we headed out to sample some of the local wine. 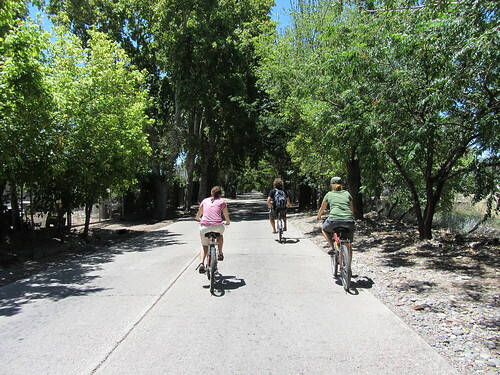 It’s incredibly easy to rent a bike for the day in Maipu, just outside of Mendoza, and just peddle yourself around some of the local vineyards, stopping to sample wine or grab a bite to eat along the way. You can take a city bus out to the town, and then walk around the main square where you’ll have your pick of bike rentals. Prices seem to be around 30 pesos per day at this point, but there is definitely a little bit of room for haggling if you are there in a slower season. Maps in hand we set off down the dusty road. Our plan was to ride out to the furthest point on the map, about 12 kilometers away, and then make our way back while sampling along the way. I’d highly recommend this route as it seems that cycling 12K after a day of drinking might be less than ideal. It’s easy to see the similarities of this area with parts of northern Italy, especially with the abundance of Cyprus trees that lined our route and we were thankful for the shade in the near 100 degree heat. There were way too many wineries for us to be able to hit them all, but we made it to Vistandes, Carinae, Di Tommaso, and Vina el Cerno, with a stop for lunch before the last tasting. 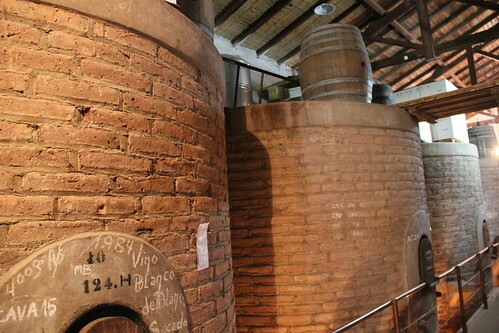 The cost for a tour and tasting ranges from about 15-30 pesos per person. Our least favorite was Vistandes, which was unfortunate because it’s a relatively new operation with a lovely building and a great tour guide. What made it our least favorite was that they served us bottom of the line wines, and only two of them, for the tasting. Why would we buy something when you give us the worst of your production after putting the best of the bottles out for display on the tasting table? 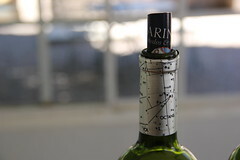 Carinae had astronomy themes running through their wines. 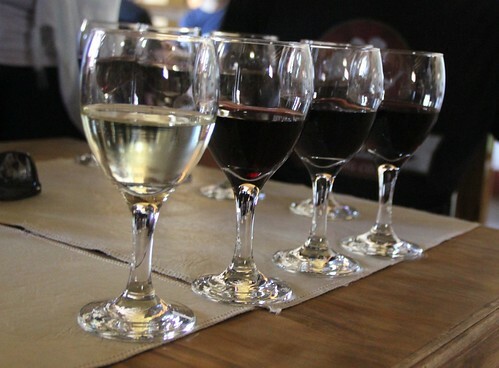 Carinae offered a few different flights of tastings, and for a few pesos more we were able to sample some of their reserve wines. We also ordered some cheese to snack on and it came with their own olive oil, which was some of the best I’ve ever had. 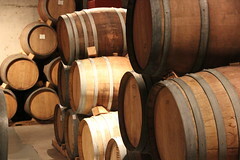 Di Tommaso was a lovely place with some antique casks and an incredible cellar. They keep a bottle from every year that they’ve produced and you can can view the ever-growing stack in the private cellar. They gave a wide variety of tastings, and will deliver any bottles you purchase to your hostel for you the same day so that you don’t have to ride around with them in the hot sun. Vina El Cerno was a clear winner, if for no other reason than that their ‘tasting’ was really 4 nearly-full glasses of your choice from their selections. 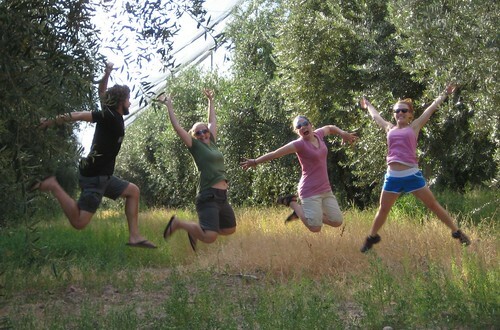 After El Cerno we took a detour into an olive orchard and spent some time leaping about, which really, after a great day of sampling Malbec, is the only logical thing to do. ← Nature is Speaking To Us. I smell a girls trip…maybe for our next big birthday…Argentina has so much to offer! Enter your email address to subscribe to The Parallel Life and receive notifications of new posts by email. Travel And Your Creature Comforts…Store or Sell? © Copyright The Parallel Life 2011. All rights reserved.